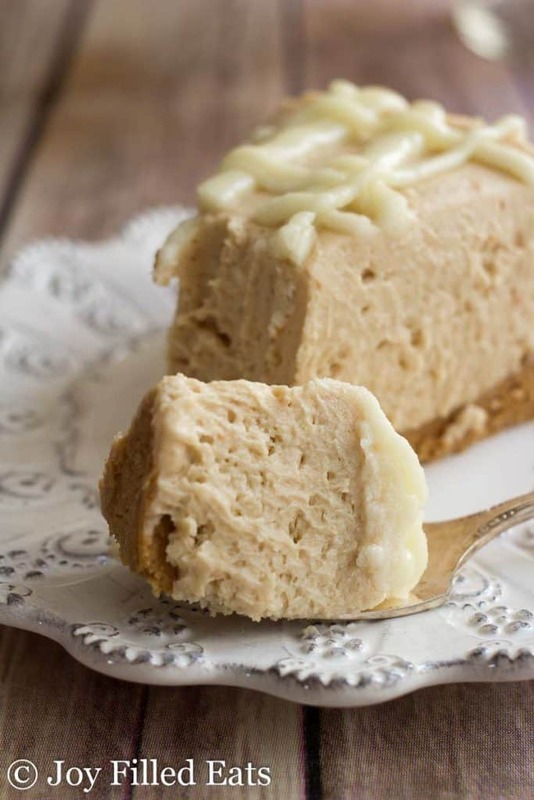 White Chocolate Peanut Butter Cheesecake. This is so rich and decadent you only need a tiny piece. It is perfect for special occasions and holidays. I have to admit that this started as an attempt at peanut butter fudge that failed. I added too much cream and was left with a delicious peanut butter sauce that I needed to use for something. I guessed that I could whip it into cream cheese for a no bake cheesecake. I guessed right. This may be the best dessert I’ve ever made. I wasn’t kidding when I said this was decadent. Take a deep breath before you look at the ingredients. It’s full of butter, heavy cream, and cream cheese. That’s why a little goes a long way. For my keto friends this is the perfect dessert. For my Trim Healthy Mama friends this is a heavy S and should be kept to special occasions. Scroll to the bottom for a printable version. This is a make ahead type of recipe. You need to begin at least 10-12 hours before you want to serve it. It’s better to begin a couple days ahead. Day 1: PB Sauce. Day 2: Cheesecake and chill. Day 3: Drizzle and serve. There are a lot of steps but none of them are very time consuming or difficult. In a medium saucepan cook the butter, heavy cream, and sweetener over medium heat until bubbly and slightly thickened. Add the cacao butter and peanut butter powder and whisk until smooth. Put in the refrigerator for at least 2 hours to thicken further. It should be the consistency of pancake batter before proceeding. You can make this part a day or two ahead of time. Mix the gelatin into the cold water until dissolved. Whip the cream cheese until fluffy. Add the gelatin and mix well. 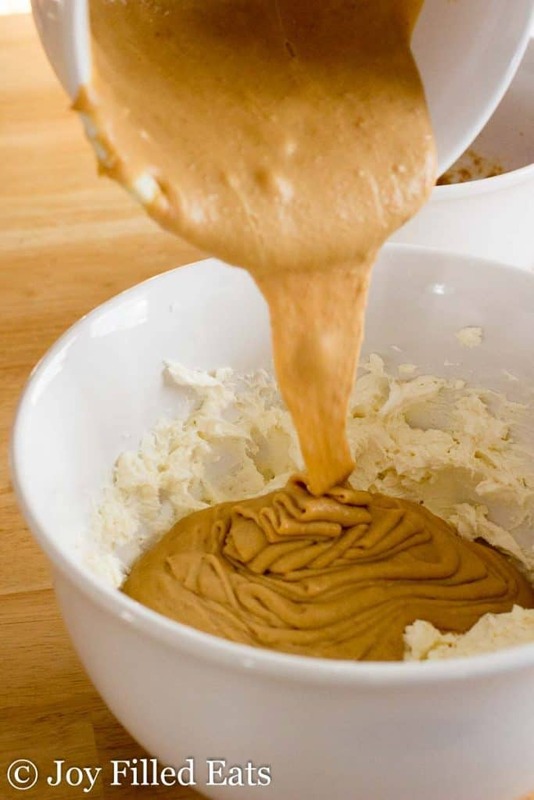 Add the chilled peanut butter mixture and mix well. Mix together the ingredients for the crust. Press into the bottom of an 8-inch springform pan. Pour the cheesecake mixture over the crust. Chill for at least 8 hours. 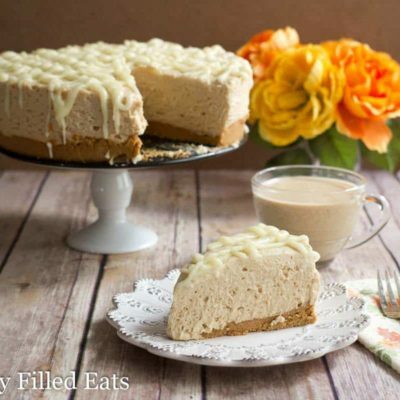 Once the cheesecake has chilled you can unmold it and drizzle it with the white chocolate drizzle. To prepare the drizzle melt the cacao butter in a small saucepan. Remove from the heat and stir in the sweetener. It will clump up. Thin it with the heavy cream 1 teaspoon at a time until it is the consistency of melted chocolate. 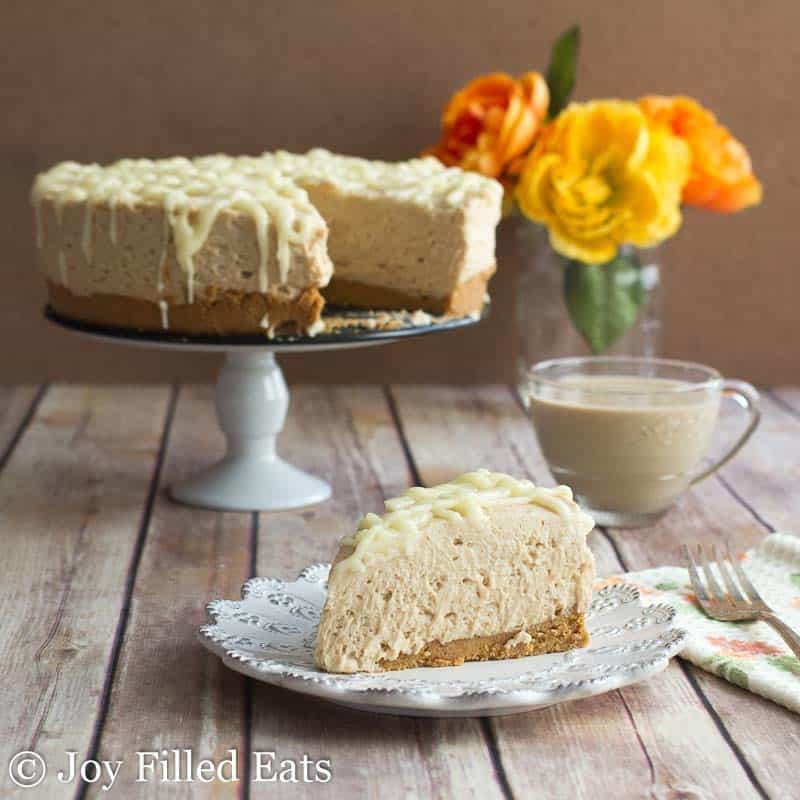 Drizzle over the cheesecake. 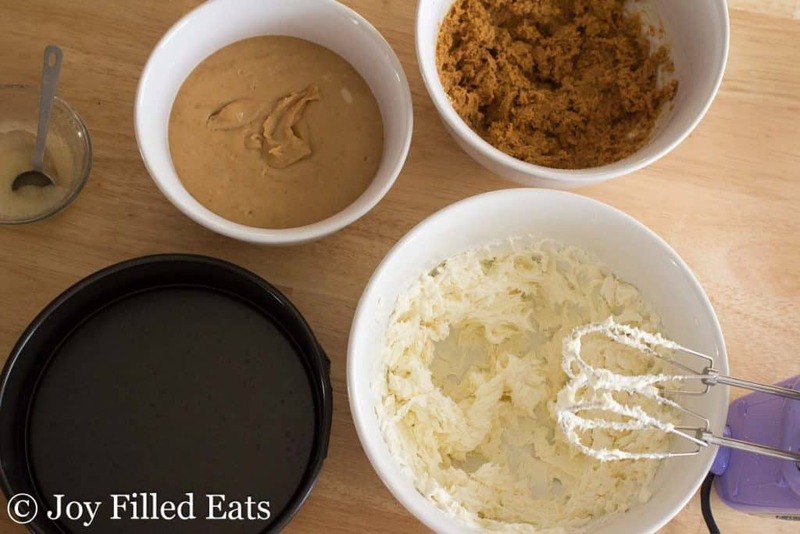 Mix together the ingredients for the crust. Press into the bottom of an 8 inch springform pan. Pour the cheesecake mixture over the crust. Chill for at least 8 hours. This is a make ahead type of recipe. You need to begin at least 10-12 hours before you want to serve it. It's better to begin a couple days ahead. Day 1: PB Sauce. Day 2: Cheesecake and chill. Day 3: Drizzle and serve. There are a lot of steps but none of them are very time consuming or difficult. Can I sub regular butter for cacao butter? Sorry if that’s a silly question. I’ve never used cacao butter before. 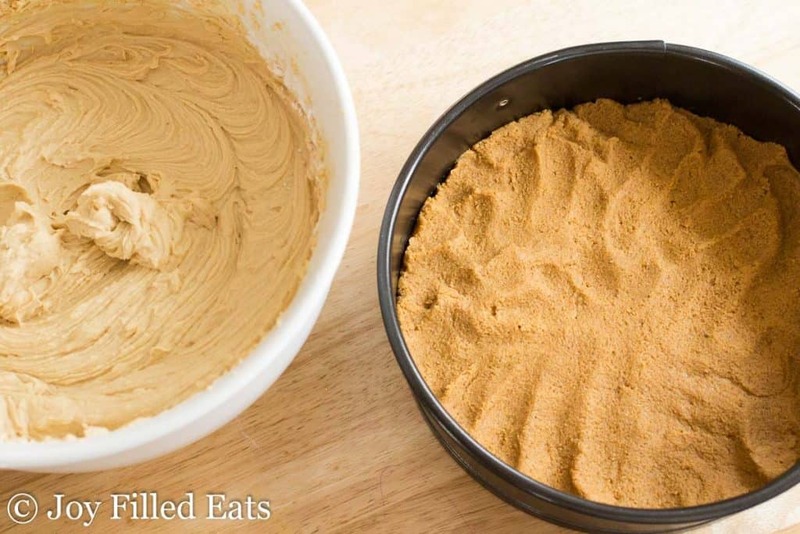 Also is there a difference between peanut butter flour and peanut butter powder? The cacao butter is similar to white chocolate. I don't think regular butter will work. PB flour and PB powder are very similar. 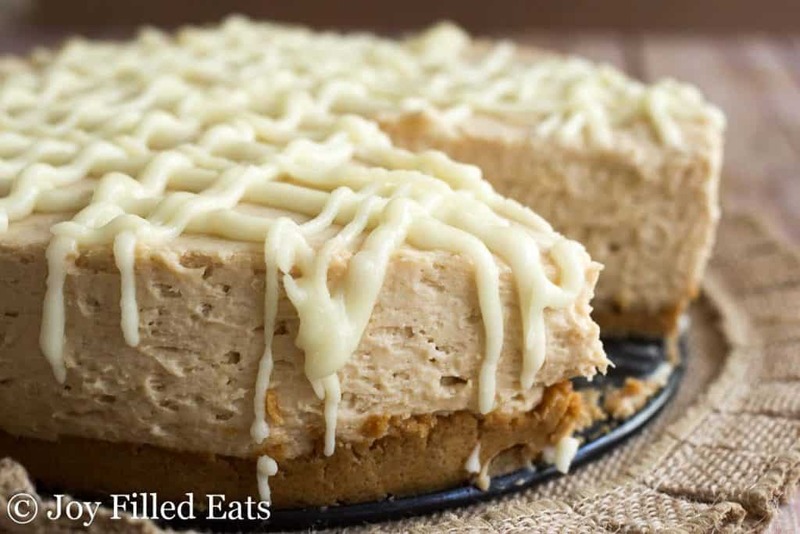 Does the white chocolate drizzle harden up or stay creamy? It hardens. It's a little softer than a standard chocolate, more like a ganache. 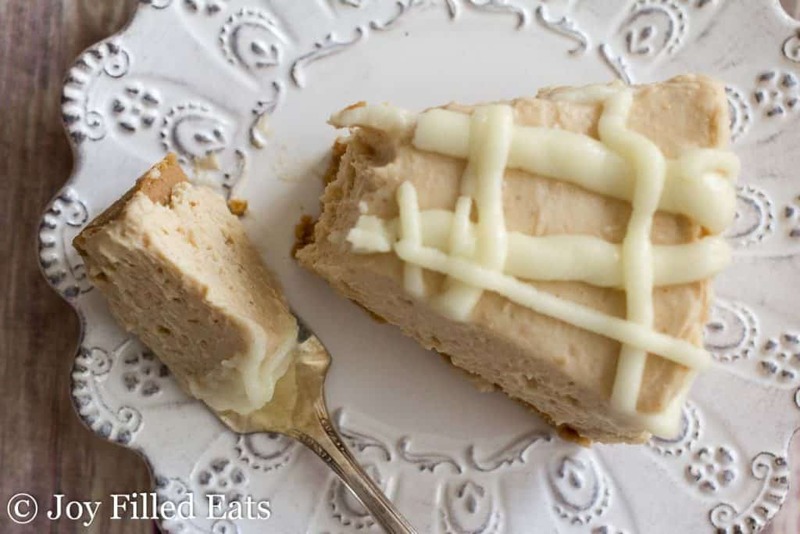 What kind of sweetener did you use in the peanut butter cheesecake filling? Would Gentle Sweet work? 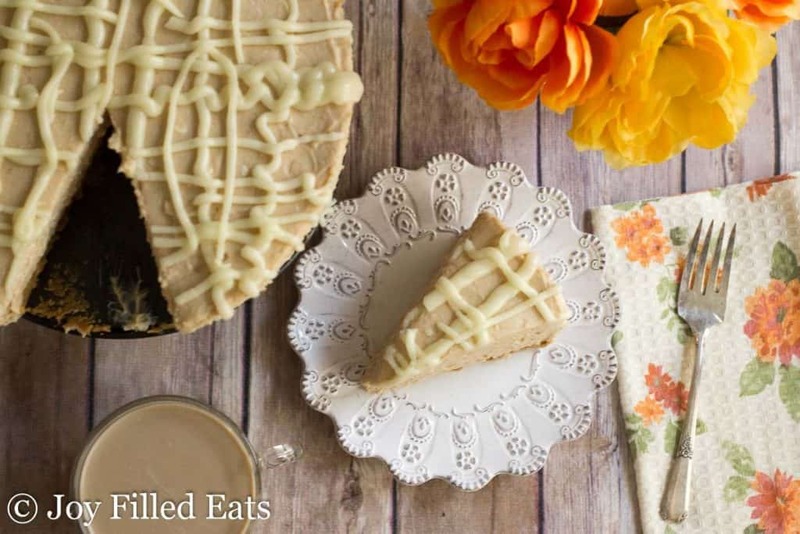 This looks like just thing perfect dessert for Thanksgiving! Would this work using half and half instead of heavy cream...or using half heavy cream/ half half and half? Half and half would probably work but you may need to cook it longer. Where do I find cacao butter? I've never used it before. Amazon sells it. Many other healthy websites have it too. Just chop it up a bit first so it fits in the measuring cup. 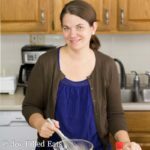 I have read the recipe over several times and can't see where you add the peanut flour? Step 2 says to add peanut butter sauce so I'm thinking you add it in step one but it doesn't say that. This looks so yummy! I just edited it. Sorry about that! You add it with the cacao butter in the first step. Can you make w/o the peanut butter? The peanut butter powder gives it a lot of its flavor. It should work to just leave it out in the cheesecake and you can make it crustless. It would be scoopable like a custard that way.